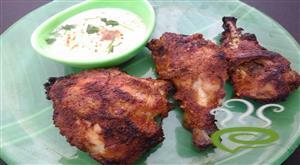 Chicken pieces are marinated in a lemon mixture for a long period. 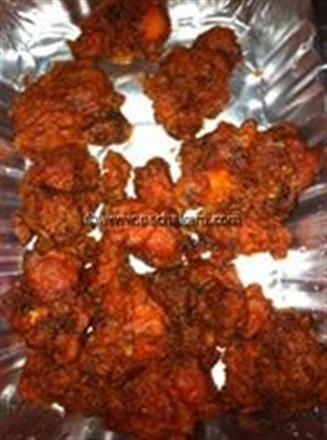 The marinated pieces are then shallow fried with a ketchup layer on top which is very appealing visually also. Cut the chicken into bite sized pieces [not too small]. In a mixing bowl, mix 3 tbsp of fresh lemon juice and salt. Add the chicken pieces and marinate for at least 10 mins. 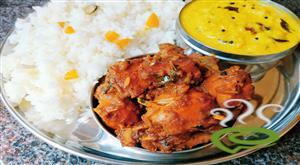 :- There should be plenty enough lemon juice to coat all the chicken. To this, add 1 tsp red chilly powder, 1 tsp coriander powder and half tsp turmeric and red food color. Mix well and allow to marinate for at least 5 mins. :- The more this marinates the better - you can leave it for 4 hrs or overnight in the fridge after covering the bowl. If you don`t have time, at least marinate for 5 mins. Transfer the above to a large microwave safe dish, cover and microwave on high for 5 mins till chicken is almost fully cooked. Remove from the microwave and drain & discard all the fluid - keep only the semi cooked chicken aside. For tempering, in a small frying pan, heat 3 tbsp of light olive oil. When the oil is hot, add 1 tsp of mustard seeds and cover the pan with a lid. Add 2 dried red chillies and fry for a minute. Turn the heat to low and add 6 curry leaves and cover the pan again. Allow the curry leaves to splutter. Once the leaves are well fried and almost dry, remove from the heat and keep the tempering aside. In a separate large frying pan, heat 2 tbsp light olive oil and add the microwaved chicken pieces. :- Be careful not to add any of the water that accumulated during microwaving: this excess water should be drained as described earlier. Shallow fry for 5 mins. 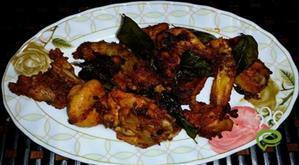 When the chicken is almost done, add 3 cut green chillies to the pan and continue frying for 1- 2 mins till done. Now the most important step - add 4-5 tbsp of tomato ketchup to the pan directly over the chicken. :- This is the secret in the recipe - add the ketchup directly over the chicken and allow it to coat the chicken. 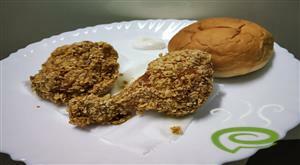 Continue frying till the chicken is coated with a fluffy layer of ketchup. Add the tempering from the other pan to the main pan and mix well. 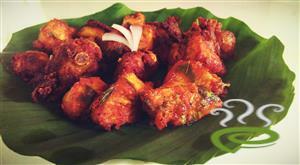 Continue to fry for 1 - 2 mins till all ingredients are mixed well and the chicken is moist but well cooked. 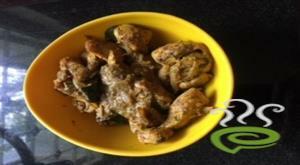 :- Enjoy delicious authentic homemade Chicken 65!! 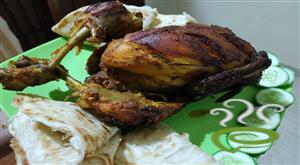 This is one of the best easy to make & super tasty recipe I personally prepared & enjoyed with my family members. The more we marinate more it tastes. I marinated with 1.5 times lemon juice and kept in Refrigerator for 12 hours keeping other ingredients same. Best dish & everybody wants to know the method. Amazing. Tried this recipe with a little variation n came out excellent. Two thumbs up for the ketchup secret. I give this recipe five stars. ???? Very very nice and simple. Thanks for sharing this yummy recipe.. I liked this recipe but the flavor of the ketchup is really strong. I would probably try using fresh tomatoes or Tomatoe Paste next time. But over-all, I would give this recipe a B, it was tasty. The dish is good and tasty. The best chicken 65 I have ever had. Really wonderful. Recommend this to ALL INDIANS. Very good recipe. The ketchup is definitely the magic ingredient! The fluffiness of the outer coating of the chicken is very tasty and visually appealing also. 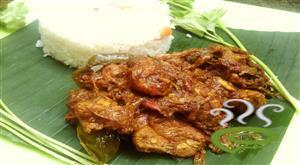 The fried curry leaves lend it that unique flavor. Very good recipe.